So let's kick this into gear shall we? The Stafford London in St James’s will be screening the wedding in The American Bar, The Lounge, and The Game Bird restaurant. Furthermore, they will be offering special dishes and cocktails on the day, including Grilled Dover sole with Dubonnet sauce and Boîtes des fraises Reine Elizabeth. The five-star hotel’s classic afternoon tea will also be given a celebratory twist, with sandwiches including Jam “pennies” and Coronation chicken, and sweet treats such as Victoria sponge with strawberry jam. The celebrated Chelsea restaurant has spread its wings to the west and opened Bluebird Café at the Television Centre White City, one of London’s hottest new developments. To celebrate the Royal Wedding, the already buzzing year-round terrace (which opens out onto a piazza overlooked by the Television Centre’s famous circular core) will be decorated with traditional British bunting, whilst a special party brunch menu will feature British classics such as Eton Mess and The Ultimate Breakfast Butty alongside celebratory dishes such as Lobster Benedict. Guests can raise a glass (or two) to the happy couple by opting for the bottomless brunch menu for £15 per person. Notting Hill restaurant Pomona’s will be celebrating the wedding of the year with a live broadcast and exquisite set menu by Head Chef Wolfe Conyngham, younger son of the 8th Marquess Conyngham (aka the rock n roll peer). For £30, dine like royalty on House-Smoked Salmon to start, followed by Roast Poussin and a quintessentially British Eton Mess for dessert, all accompanied by a Kingly cocktail to toast the bride and groom. 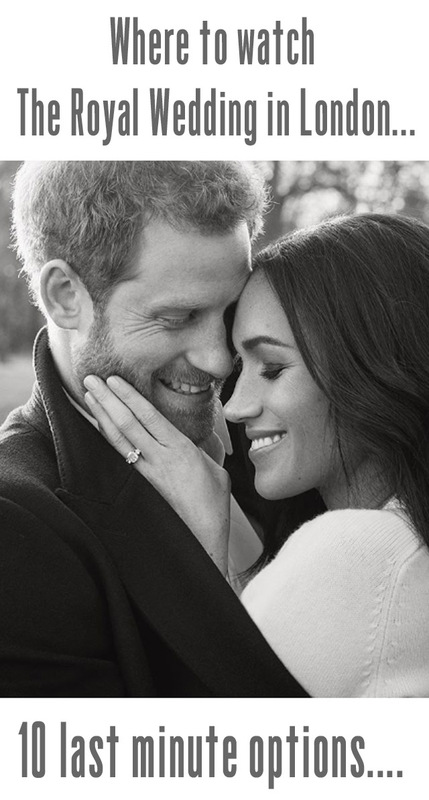 As the country prepares for the wedding of the year, Greenwood in Victoria will be toasting Harry and Meghan with an exclusive Bottomless Pimm’s Brunch and viewing party. Expect a royally good Saturday afternoon with Pimm’s galore, whilst watching the day unfold across on one of its sixteen large plasma screens. Priced at two courses for £35 or three for £40, American-style dishes including mac ‘n’ cheese balls and shrimp and bacon croquettes, provide a welcoming curtsy to Meghan; whilst quintessentially British plates such as Eggs Royale and avocado on toast (plus free-flowing Pimm’s! ), are enough to make a Prince proud. The limited edition Bottomless Pimm’s Brunch is available from 11am – 5pm, for two hours, on Saturday 19th May only. Nestled in the heart of leafy West London, Ealing Park Tavern, will be teaming up with Pimm’s to host a right royal British Garden Party to celebrate the newlyweds. Complete with a live wedding broadcast on the large outdoor screen, an impressive hog roast and Pimm’s flowing, the spacious garden is the perfect spot for family-friendly lounging. Entry to the party is free, so what better excuse to head to South Ealing for a royal bottom’s up! Drake & Morgan bars and restaurants will be showing live coverage of the Royal Wedding across a number of its bars and restaurants, listing below. To celebrate the royal nuptials, all Drake & Morgan venues will also be serving a limited-edition Meghan Sparkles prosecco cocktail, a royal treat, mixed with Ketel One Vodka, elderflower, vanilla, peach bitters and fresh blackberries and of course topped up with prosecco, costing £8.95. As Prince Harry and American beauty Meghan Markle prepare to take their love to new heights, toast from spectacular heights of your own at sky-high restaurant, bar and terrace Bōkan in Canary Wharf, who will host the ultimate royal wedding soirée on Saturday 19th May. Watch the entire wedding day unfold on giant screens placed on floors 38 and 39, home to Bōkan’s industrial chic-bar and outdoor terrace with360° show-stopping views of the iconic London skyline. Tuck into limited-edition transatlantic picnic baskets filled with quintessential British and American delicacies, created by talented head chef Aurélie Altemaire and toast to the newlyweds as they say “I do” with Meghan’s Sparkle. Handcrafted by Bōkan’s creative bar team, the cocktail is inspired by the flavours of Meghan and Harry’s wedding cake and made with Nettle Hendrick’s, cucumber tonic, cordial, prosecco and elderflower. Soak in the patriotic atmosphere with bunting, flags and of course Harry and Meghan masks for the perfect Royal Wedding insta-posts, whilst enjoying the beautiful sights London has to offer. The Waterway, renowned for its great food, fabulous location on Regent’s Canal and expansive all-weather terrace, is taking things up a notch with a live Royal Wedding broadcast and some indulgent Anglo-American brunch specials. Tuck into the Meghan Royale, a decadent waffle topped with half a lobster, poached duck egg and saffron hollandaise (£21); or Harry’s Hotcakes, fluffy American-style pancakes with English strawberries and a rich maple cream (£7.95), whilst watching the special day unfold. The exclusive Royal Wedding brunch is available from 10am - 1pm on Saturday 19th and Sunday 20th May. Where better to soak up the Royal wedding than at a great British pub? This May, head to one of the many Young’s pubs screening the big occasion, including The Devonshire, Balham; Lord Palmerston, Tufnell Park; and The Narrow Boat, Islington to get your regal fix. With a pint in hand, get ready to toast the ‘kiss’ – you’ll do Harry proud! Other Young’s venues screening include: Trafalgar Arms, Tooting; County Arms, Wandsworth; Princess of Wales, Clapton; Duchess of Kent, Islington; Bishop, Kingston; Spring Grove, Islington; Marquess of Anglesey, Covent Garden; Dial Arch, Woolwich; Orange Tree, Richmond;Prince Albert, Battersea; Old Ship, Hammersmith; Queens, Primrose Hill; Kings Head Theatre, Islington; Beaufort, Hendon; Flask, Hampstead;Roebuck, Hampstead Heath; Spread Eagle, Camden; The Fellow, King’s Cross; The Grocer, Spitalfields. Known for creating eclectic cocktails in its Bar Lab, the pan Asian restaurant and bar in Covent Garden invites you to drink like a true Windsor, with a limited-edition list inspired by the Royals’ favourite tipples, available throughout May. Sip on the Sparkle Like Markle, a cask-aged Negroni (£13), to channel your inner American princess; or enjoy a spot of whisky as Kate Middleton often does, in the form of The Duchess – Japanese whisky, Pineau de Charentes and Pedro Ximinez (£12). Former party boy Harry’s drink of choice is naturally vodka, which the talented bar team shake with honey, lemon, soda and a drop of soy sauce to create the Marry Harry (£9.50). A Truly British Affair (£13) – cask-aged Sauternes with gin and dry vermouth, is an Asian Table twist on Charles’ favourite cocktail theMartini; or God Save The Queen (£11) includes the Queen’s favourite spirit gin, along with Thai basil, mandarin liqueur, kumquat jam and lemon. NOTE: Also remember to check your local council's website. They will have a listing of the street parties in your area that are taking place on the big day! HAVE A GREAT TIME!!!!!! And hopefully I'll see you out and about!